Mission La Purísima Concepción. Courtesy of Santa Barbara Mission Archive-Library. Mission La Purísima Concepción, the eleventh mission in the chain, was founded by Father Lasuén on December 8th, 1787; the feast day of the immaculate conception of Mary the Most Pure. The only California mission not organized around a quadrangle, Mission La Purísima was built in a linear fashion. The mission leaders choose the linear layout to avoid flooding patterns and because the mission leaders felt the docile Chumash did not need to be contained within the typical fortress like quadrangle. The mission sits on a sprawling nine hundred sixty eight acres of land and is today surrounded by two thousand acres of parkland. The landscape is home to a wide variety of crops and animals where still today horses, cows and deer room the mission grounds. The structure of Mission La Purísima has been rebuilt several times. 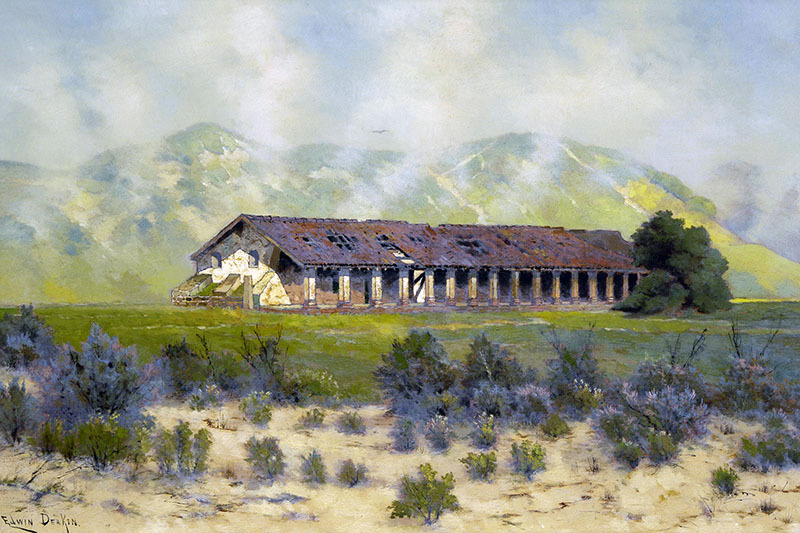 The first mission complex, originally built at the Indian village of Algascupi, collapsed and was rebuilt of adobe in 1802, but an earthquake in 1812 brought the mission down again. In the spring of 1813, the mission was rebuilt about three miles from its original site in the Valley of Watercress. On a military front, defense was important in the survival of each mission. The mission had a squad of five soldiers called Soldado de Cuera, or leather-coated soldiers, because they wore short protective coats made of animal hide. They lived here to protect the mission from intruders and to maintain order. In 1824, an Indian revolt that started in Santa Inés spread to Mission La Purísima. With the soldiers unable to keep control, the rebellious Indians captured the mission for nearly thirty days. The revolt caused great damage along with the deaths of sixteen Indians and one soldier. It wasn’t until state guards were sent from the Santa Barbara Presidio that the disturbance ended. Mission La Purísima is a “living history” museum and a site for frequent reenactments and encampments. Volunteer group The Prelado de los Tesoros de la Purisma annually hosts “Mission Days” in which area residents relive the life of La Purísima and display the skills utilized at each mission. Mission life was self-sufficient; the residents baked their own bread, they grew their own fruits and vegetables and measured grain with a fanaga, the equivilent of 1.6 bushels. Water was transported through an elaborate system of aqueducts, pipes, reservoirs and filtration buildings. Rawhide braiding was also a common practice at the missions, as well as candle making and wool spinning. From US-101: Exit and proceed west on CA-246. Turn right on Purisima Road. 9am - 5pm daily; closed Thanksgiving, Christmas, and New Year's Day.